A plea for charity from one who was denied recognition of a Catholic higher education and suffered poverty as a consequence, with special interest in leading solutions to the challenges that affect our world’s poor and rich equally. I address this letter to his holiness Pope Francis, the first of his name, with the hopes that he and you, and all people will benefit from its contents, from thoughtful consideration of the educational merits thereof and from the spirit of love and genuine friendship in which it is given. Our interest is to consider the relationship of modern science to ancient religious ideas, where they coincide in humanity’s persistent efforts to gain true Knowledge about the world we share in common, to aid our survival and perpetuation. We view modern science as an extension of Religion and Philosophy both. Just as the classification of living creatures in biology derives from Aristotle’s categories and similar methods of organizing information about the natural world; so too does astronomy owe much to the ancient astroloters, for their recorded observations of stars over the centuries allowed men such as Galileo, Copernicus, Edmund Halley and Sir Isaac Newton to make accurate calculation of the motions of planets, stars and comets in the heavens. These calculations were a significant leap forward in humanity’s intellectual development, providing a conceptual framework for the evolution of higher mathematics that, in turn, allowed the explosion of technology we have inherited and depend upon for our prosperity. Science, like Religion, is interested in universally valid knowledge, or Truth properly so called. However, the debate rages between them. Is it science or religion? Whose science? Which religion? There are so many options to choose from and we all want to choose correctly… well, maybe not all of us, but at least those who are interested in Truth would certainly like to Know. This is Gnosis: many words for one whole Truth, universal and eternal. Yet, some point to ancient Gnostics, so-called “Pagans”, others, and say they are wrong, as though any one of us is totally infallible. Of course they were wrong. I also am wrong sometimes. You, the pope in Rome, are wrong sometimes. Even the President of the United States of America can be wrong sometimes, believe it or not. Richard Dawkins and Wendy Wright? I am sure of they both have made mistakes along the way. Alan Greenspan was at least honest enough to admit his error – that he wrongly put his faith in the markets – which precipitated the financial crisis of late memory (causing poverty and hardship for a great many people, lest we forget). The question thus arises, how do we reconcile these disagreements? How do we mend the rift between Science and Religion, between this religion and that religion, between these people and those people? Here we enter into an ethical consideration: what is the right or wrong way to proceed? Each of us must make our own decisions and, if my opinion could have any weight, I would say we each must be free to make these decisions without the fear of violent coercion from any of our fellows. Alas, some would view that as Anarchism and disapprove. Are they right to do so? How can we know? Naturally, many of us look to authority for guidance. But, which authority can be trusted? Still, no agreement. Thus we have politics, rage fuelled debates and violent atrocities. The strife in our world today seems unending. Every day brings news of some horror, some impropriety, some tragedy. Where is the good news? What are the positive trends? What are the human activities that bring us closer to that utopian “Kingdom” of Heaven, where all “God’s” creatures can live happily, free of fear (even the Anarchists)? That is why I am writing to you, today, Mr. Pope. I felt that your Franciscan message of generosity and service to the poor was a positive development: an activity that could bring us closer to the Utopia we seek, if it is taken up by many people (even the Anarchists). So I put myself to the task, took to contemplation of what service I might render to the poor and rich alike, to carry the light of goodness inspired by your work. I realized that all people could benefit from a calmness of spirit that is undermined by the persistence of so many unresolved conflicts and debates. The dimensions of the challenge are enormous, if you can imagine all the layers of conflict in our lives, as they are affected by the contest between ideas, as they relate to our struggle for survival in comfort without worry. How do we achieve peaceful reconciliation, when all sides are entrenched in their individual, subjective perspectives? We must transcend them. We must build bridges of understanding, to connect and reconcile the rifts that have grown up between people and been the cause of so much unnecessary discord. We must, in a word, progress, if we are to have any hope of manifesting a more heavenly circumstance here on Earth. Where to begin? Creation. My creation (this Open Letter) begins with a word. There follows an explosion of ideas, together forming sentences, whole paragraphs, with each catena expressing successive interdependent symbol images. Within this structure, everything ties back to that initial cause, a decision I made, and even further back through all the preceding events and circumstances that conspired to provide me with language skills and technology whereby to share my thoughts with you today. Everything is connected in this way, back to the beginning of time. Can I pretend to possess perfect knowledge of how that all happened? Will you? With a calmness of spirit, I can accept that we each have different answers to these questions. I feel no need to insist that my beliefs be your beliefs, but I will share them equally because at the end of the day we have more in common than mere words can express. I believe that we each depend on basic necessities, food, water, shelter, and a healthy, loving environment for our happiness and survival. I believe these necessities are natural priorities, transcending all other concerns, and the root of the most distressing conflicts in our world today. With a calmness of spirit, we can approach these troubles in a non-confrontational manner, perchance to discover solutions to the pressing challenges of our day. We begin with food, because this is our basic biological drive: to collect the molecular building-blocks of all the cells in our bodies. Water allows these molecules to be transported within and between these cells, so its importance is undeniable. Shelter is only a concern when our natural environment becomes inhospitable, as I’m sure even the Pope in Rome has experienced. Most of us prefer to feel safe and comfortable. Hence, a healthy, loving environment is the logical ideal. How do we satisfy these needs? Historically, we have done this by working together in groups. Co-operation and the sharing of resources allowed our ancient ancestors to survive and even thrive at times, in many different ways. However, people have never had equal access to the bounties of Nature. We call the lack of basic necessities “poverty” and see that it has caused much suffering and misery, for man and beast alike. Our impulse is to avoid this suffering and to protect those we love just the same. The result has been the gradual development of all the technology we use to ease our burdens, to shelter us from unhealthy environments and to increase the quantity of food and drink available to our families and friends (though not as often concerned for those ‘others’ over ‘there’). Unfortunately, today the technology itself has become a problem. Pollution, resource depletion, global conflict, climate change, all tied to our common struggle for prosperity and good health, ironic as that may be. Is there no other way? I believe there is. I believe we can nourish, protect and shelter all “God’s” creatures, if we put our minds to the task. So, I have put my mind to the task and have had plenty of time for this contemplation, after falling out of a Catholic University and landing flat on my face. My saving graces have been a family that supports me, my friends who lifted me up, among them many anarchists, communists, liberal feminists, gays, trans-genders, polygamists, even a few Catholics, and a prosperous nation to shelter me from the storm of life. I will always love these people and no amount of coercion will ever change my belief: I will not recant! Yet, should I deny such privilege to another? Never. God knows, when I can help, I help. When I can give, I give. I pay it forward, just as I received it, seven-fold, promise kept. Will you pass it along? I am sure the Pope will approve. The question remains, whether or not the Pope will help me when I ask him to? Is it reasonable for me to make any kind of charitable request from such a man? To seriously expect a response? We cannot know, unless I make the effort. My hope is that the Pope will answer my call and help me to heal the division and strife between so many competing ideologies and their partisans, to advocate and emphasize the common ground, the perennial Truths, shared between all the world’s great traditions, and to widen the space that has been created for free and open discussion of these topics. I believe that a universal Truth exists, but I cannot comprehend it wholly. It is something like examining the facets of a gem, each new insight allows only a partial view of the total picture. So it is with our words and numbers, attempts to convey the light of human reason, only ever to reveal a fraction of the whole Truth of truths. Our educational pursuits are stimulated by this same desire, to gain a more complete and accurate understanding of the many ideas that have been passed down through the ages. Yet, again we find this pursuit of knowledge has been a source of conflict in history, with so many debates concerning the relative authority of individual ideas. Who is right and who is wrong? Who can say? A king, some would say, a priest, a judge, a lawmaker, a philosopher, a scientist, or doctor, could have authority to make such assertions, yet still he is subject to err. The Pope would be well within his rights to anoint me as a king, as I am a distant relation of the British Royal Family, my accession could not be disputed. But a king of what? I hold no territorial claims, save those that were stripped from my ancestors in day long past. On the other hand, much like the Pope in Rome, I am charged with the preservation of a tradition of great antiquity and value equal to that of the Catholic Church. Were I anointed king, given all the respect and diplomatic privileges afforded to other sovereign head’s of state, I could become a great advocate for the preservation of our human heritage, in true bardic fashion. It would be poetic justice, for the oral historian of an ancient tribe to return his family’s name to an honor and dignity so long denied them. Name me King of No Thing, sovereign ruler of My Self and reasonable judge of All Things, whose authority may be questioned, but not denied. I would use my authority to convey a clear-sighted view of the challenges we share, with an eye to the development of real solutions to supply the needs of our world’s poor, to lead improvements in the production and distribution of basic necessities and the establishment of a global safety net for the greater prosperity of all nations and people. Working together, we can solve the challenge of poverty for all people, forever. The first step moves us beyond rhetoric: to action. A certified lunatic, Antonin Artaud, believed that a simple gesture can be among the most powerful actions in our repertoire of possible actions. By his logic, a simple gesture can move mountains and raise rivers from the seas. If a Pope clapped one hand, would the heavens resound? Go on, give it a try… My dream is to make such a gesture as would allow me to oversee an infrastructure project spanning the entire globe, creating thousands or millions of jobs for the benefit of all communities, by harnessing the power of the sun and moving water from where it is found to where it is needed to grow food and produce goods. If enough food and water were made available, we could lift all people out of poverty, everywhere they lack access to these basic necessities. Can you imagine the difference it would make, if people in Palestine could turn on their spigots and find clean, pure, holy water, in the Holy Land? India? Africa? All people, everywhere on Earth, stand to benefit from the effort, from my effort: a simple gesture. Please Mr. Pope, I need your help. I believe you will recognize the merit of such good works, as they will bring us steps closer to your “Kingdom” of Heaven, a happy utopian dream-land. We can rule the world together, just you and me. What do you say? Will you do me this charity, restore the honor of my ancestors who suffered the harshest poverty imaginable, exiled from our homeland and discriminated against for more than a thousand years, whipped and beaten in the streets, even sold into slavery? Will you bless my good works, for the benefit of all people? Will you anoint me? Before you answer, consider that I have spent the past six months in unpaid, voluntary service to one of your flock, donating my time and effort to the realization of his entrepreneurial vision. So far, the response has been muted and our optimism stymied, for how long we have waited to taste the fruit of our labors. Lacking access to capital, our capacity to respond to the challenges of economic development is limited. Were I a king, I could levy taxes and issue bonds to fund our efforts, but as it stands I am a poor man at the mercy of a banking cartel whose credit rating system is the instrument of my ruin. A Catholic University is partly to blame, so your gesture would be a great first (yes, first) step towards reconciling past wrongs and acknowledgement of my constant enthusiasm for the life of service you have advocated, in the spirit of Saint Francis. 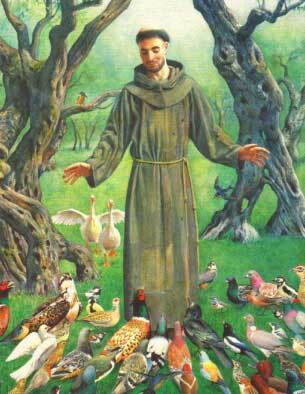 Also consider the wisdom of another famous Franciscan, the seraphic Saint Bonaventure, whose Theology of History prophecies a coming Seventh Age of Peace, building from the momentum of Francis’ contemplatio towards a higher and more complete revelation, based on a direct, experiential mysticism, sursumactio, as your predecessor has written. This experiential mysticism is characterized in the rapture described by Saint Paul, direct communion with a higher imminence, a great Being. In its elements, this hardly differs from the teachings provided by so many other mystical traditions, the Gnostics, Sufis, Sabians, Hermetics, Jains, Buddhists, Taoists, Vedantists, Essenes, and many others, stress the need for individuals to form a personal connection with the higher power, the All, where ultimate Truth resides. Several of them employ the same image of a fountain of light, it’s water flowing down to us through space and time from the Source of everything at the beginning. Others describe a great tree whose branches are all the stars and whose trunk and roots extend back to the Source of everything. Legend says, if we could taste the fruit of that tree, or wash ourselves in the water of that great fountain, our eyes would be opened to a more perfect Knowledge. A higher mathematics allows us to sketch an abstract picture of that cosmic tree, the course of its river veins flowing back to a massive explosion at the beginning of observable time. The universe of our experience has been modelled based on the trajectory of so many visible particles in space and their gravitational inter-relationships. The same mathematical reasoning, in the Russian multiverse hypothesis, suggests the possibility that our observable universe formed from a larger whole, what we might call super-imminence, where many such universes, of equal immensity to our own, could exist simultaneously. This presents a conception of reality on a profound scale, so far beyond our everyday experience it can hardly be contemplated without leaving the subject in awe. In that context, what is the life of one man? Now, we are told by the Hindu Vedas that this super-imminence is called Brahman and that the universe we experience, our cosmos, all observable space and time, prakriti, is born out of the eternal substance of Brahman, the primeval material or chaos, subject to a cycle of creation, sustenance and dissolution. So much for the universe. But, what does this mean for us here on Earth? We experience the universe through intermediary senses as a dream or illusion they call maya. According to Brian Hodgkinson, “Maya is the dream of Brahman, the grand illusion of the world, which contains all that we ordinarily believe to exist… in so far as it exists, it does so as an emanation of Brahman itself.” Here we find exceptional agreement with the multiverse hypothesis just mentioned. If the word Brahman describes the primordial waters (Hebrew: Tehom; Akkadian: Tamtu; Ugaritic: t-h-m) whence our universe emerged, the super-imminence, can we safely say that a higher mathematics has given us deeper insight to these ancient ideas, shining a beacon light on the Knowledge we have sought for so long? I believe it is possible. Could we part the veil, to peer into that abyss beyond our universe, what would we see? I do not know. What constitutes knowledge? I cannot say. However, I can apply the same ‘scientific’ reasoning to my contemplation of other ‘religious’ ideas, such as the belief in karma and rebirth of souls. The Vedas teach that each individual, from conception, inherits the karmic debt of its former incarnations, and may evolve to either a higher or lower form in its subsequent incarnations depending on actions taken in the present. A similar notion is found in the evolutionary biology of Charles Darwin and his peers, that individual organisms inherit their traits from both parents and the generations preceding them. These teachings, like so many religious doctrines, encourage the student to Virtue, to make decisions that will allow both present and future incarnations (or generations) to thrive. Yet, they also awaken us to the possibility that Nature (prakriti) includes the potential for organisms (or souls) to develop traits that would allow us to transcend the boundaries of the sensible universe and directly experience that which lies beyond, becoming one with the Brahman, as they say. Would this not be essentially the same as the rapture of Saint Paul? I believe it is possible. Beyond space-travel, to transcend the barriers of space and time, emerging outside the confines of our universe, is the most profound adventure that I can imagine. To think, with this in mind, that any creature on Earth, anywhere in the cosmos, possesses the inborn potential to achieve such a feat, and yet we see everywhere suffering and death… what follows? Is it oblivion after, or something far worse? I hope for better, for all people. That is why I am writing to you today, Mr. Pope. I believe suffering death in poverty is the worst possible outcome of the miracle of life as we know it. No man, woman or creature should be subjugated with such cruelty, when we all possess the most amazing potential. Why should I deny anyone the greatest chance at survival, deny them the possibility of these transcendent adventures? No, I choose instead to contribute to the welfare of people, the preservation of non-human life, and a rational distribution of resources, by contributing to the development of renewable energy technologies, conservation efforts and sound agricultural practices. In this effort, I hope to gain your blessing and the support of your Church. Without your blessing, I fear I may never emerge from the valley of death that has mired all my entrepreneurial ventures so far and left me begging for change. What is my life worth? Is my learning inferior to a Catholic higher education? Am I not qualified to have a voice in human history? These questions you must answer for yourself, I can only suggest my opinion. My opinion is that every single life has value equal to any king that ever lived, that my learning is at least equal to a Catholic higher education, and that I am fully qualified to have a voice in human history. So, once more I ask, Mr. Pope, will you anoint me? Will you welcome me into your home and perform the ancient ceremony, my rite of passage? Name me King of the World and I could be humankind’s first official ambassador to the heavens, to represent our educational attainments, our arts, our sciences and most cherished traditions in dialogues with what other intelligent life exists in our vast cosmos. In exchange, I will teach you how to feed our world’s poor. Or, follow the example set by your peers: ignore my plea for charity and condemn me and my dreams to suffer oblivion death. The choice is yours. The question is not how far we are willing to go, but what we shall do when we get there… The future will be what we make it.